NCPA is packaged for most common platforms including Windows, Linux systems with RPM and DEB packaging, and Mac OS X. Packaging is the one portion of NCPA that cannot be truly platform agnostic. However, having pre-built packages for NCPA allows for quick and easy installation and minimal dependencies. This documentation will give examples of how to get started using NCPA. First, download the latest Windows installer to the system you are installing on. There are two types of installations you can do in Windows. The first install type is the graphical install which uses the standard graphical install with user prompts to adjust NCPA settings and writes the ncpa.cfg file for you. The second install type is a silent install which can be ran from the command line by passing your own settings in the command which can be useful when deploying NCPA on multiple systems. To get started right away, we recommend doing a basic graphic install first. Navigate to the location that the .exe was downloaded to and double-click the installer. After agreeing to the license terms, you will find a series of configuration screens. Each screen is shown below with setting explained. The first thing you'll be prompted to do is accept the licensing agreement for NCPA. It's fairly straightforward. Once you agree and accept the license you'll continue on to the configuration steps. Note: The configuration steps below are only shown on an actual install. If you have already installed an older version of NCPA you can upgrade by running the new versions installer. You will skip the configuration steps and use the same configuration you already had. Token - The token used for API calls (from Nagios XI config wizard, check_ncpa.py, curl, etc) and logging into the GUI. Bind IP - The IP to bind to. Leaving it 0.0.0.0 will bind to all available. Bind Port - The port to bind to. By default it binds to 5693. SSL Version - Choose from TLSv1.0-1.2. Defaults to TLSv1.2. Log Level - Should be set to warning unless you need more info for debugging purposes. URL - The URL to the NRDP server. NRDP Token - The token defined on the NRDP server for receiving the passive check results. Hostname - The value that will replace %HOSTNAME% in the passive check configurations. Check Interval - The default check interval in seconds for passive checks. You can override this by setting a duration on the check itself. If the send checks over NRDP check-box is selected, the NCPA installer will give a list of default passive checks that it will write into the ~NCPA/etc/ncpa.cfg.d/ directory as nrdp.cfg. You can also change these check definitions later. Once you're done with configuration, you can set the location for NCPA to install and start the installation process. The installer will copy the files and create the NCPA services; one for the GUI, live stats, graphing, API, and active checks (NCPA Listener) and one for passive checks (NCPA Passive), and will start the services with the settings you specified during the install. An alternative to the graphical installer above is the silent install method. Silent install allows you use the NCPA installer from the command line. Doing so will let you pass config values directly into your initial ncpa.cfg before the first start of the NCPA service. This can be particularly helpful when deploying on a large number of machines. In order to use the silent install, you must pass the /S value to the install as shown below. The /D command is optional, must be the last argument, cannot contain quotes, and must be an absolute path. The above command would set the token in your ncpa.cfg to mytoken. The silent install will install and start the NCPA listener and passive services. That's all you need to do. Below is a reference of all available configuration options for the silent install. Note: These variables correspond to locations inside your ncpa.cfg and can be changed at any time. Variable names are case sensitive and must be in all capitals. TOKEN Required The token for the web GUI, check_ncpa.py, and accessing the API. IP The IP address to bind to. Default is 0.0.0.0 which is all IPv4 addresses. IF you'd like to connect to IPv6 you must use ::. PORT The port to bind to. The default is 5693. NRDPURL The URL to the NRDP server you'd like to send passive checks to. 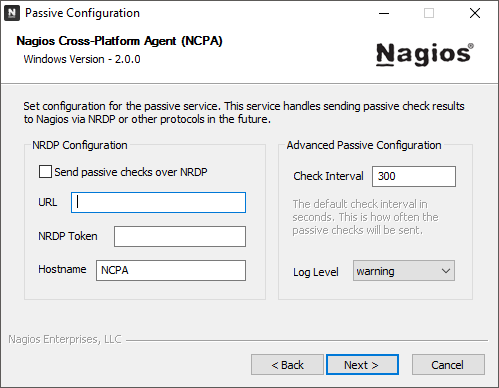 Setting an NRDP URL will make NCPA automatically start sending the default passive checks after install. Do not set the NRDP settings if you'd like just the active agent. NRDPTOKEN The authentication token for the NRDP server. NRDPHOSTNAME The hostname you want to send to the NRDP server with each service check. We build for a variety of linux types, so you will need to verify if you are using a RPM or DEB based Linux distro. You can view the RPM install for CentOS/RHEL, Fedora, SUSE, etc or DEB install which covers Debian and Ubuntu. Download the latest RPM package for the operating system of your choice. If you are using CentOS or RHEL we recommend using the Nagios RPM repository to install NCPA. If you are not using the RPM repository (not using CentOS/RHEL or want to manually install) download the RPM file to your /tmp directory and run the following to install the RPM package using the rpm command. You could also install a local package using yum or zypper but we won't use those in this example. Now that it's installed, you should do the initial configuration. The service should stop and start without errors. You are now ready to start using NCPA. Once successfully installed, you can unmount the NCPA installer and continue to the web GUI. The system should immediately start installing NCPA and all of it's components. The default location is /usr/local/ncpa. Wait for it to exit, and continue to configuration. Once NCPA has been successfully installed. Verify that the GUI works by navigating to https://localhost:5693/ on the computer you installed NCPA on. If you've installed NCPA on a server with no GUI, use the IP address/port combo instead. The NCPA installer does not change any firewall configurations on Linux or Mac OS X; you may need to configure it. Note: NCPA does not automatically modify the firewall on Linux or Mac OSX. The windows installer will open the port specified by default. However, on Linux you will need to manually verify the port that you will be using to connect to NCPA with. By default the NCPA port is 5693 and can be edited in ncpa.cfg. To log into the web GUI, use your token that you set during install. Later on you can configure NCPA to lock the web GUI with an admin password and disable access to it using the token. Once inside the GUI you'll see a main dashboard with a little bit of information about the system the NCPA is running on. Take your time and play around with the GUI. There are a lot of useful features that can help you get an idea of what NCPA can monitor for you. Don't worry if you don't see everything you want to monitor in the API, you can run your own custom plugins too. The main page of the GUI with a bit of information about the currently running NCPA process and the operating system it's running on. A new section in NCPA 2 that allows you to see the checks that have been performed on the NCPA agent and from where. By default it only shows the last 30 days of check data. 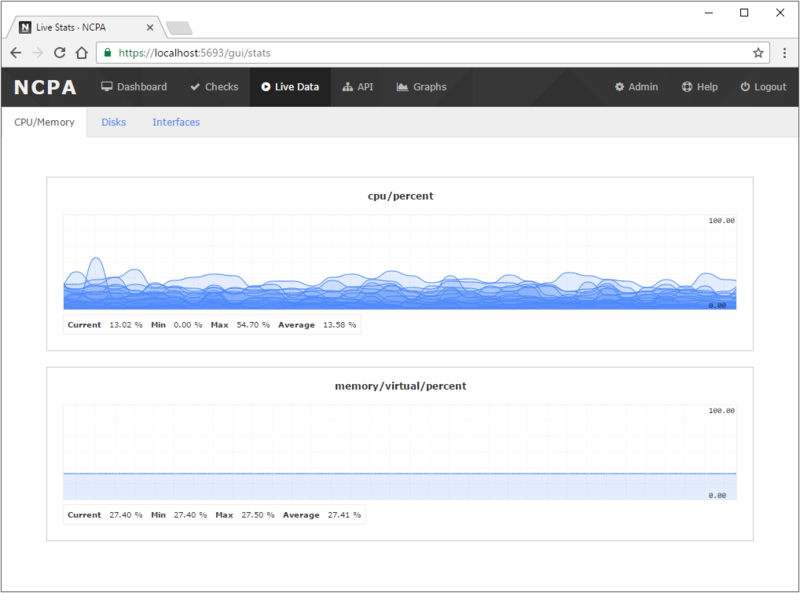 A full set of live data graphs using websockets. These are real-time graphs showing things like CPU usage, memory usage, and bandwidth. These are examples of the graphs that can be created and embedded using the graph generator in the Graphs tab. 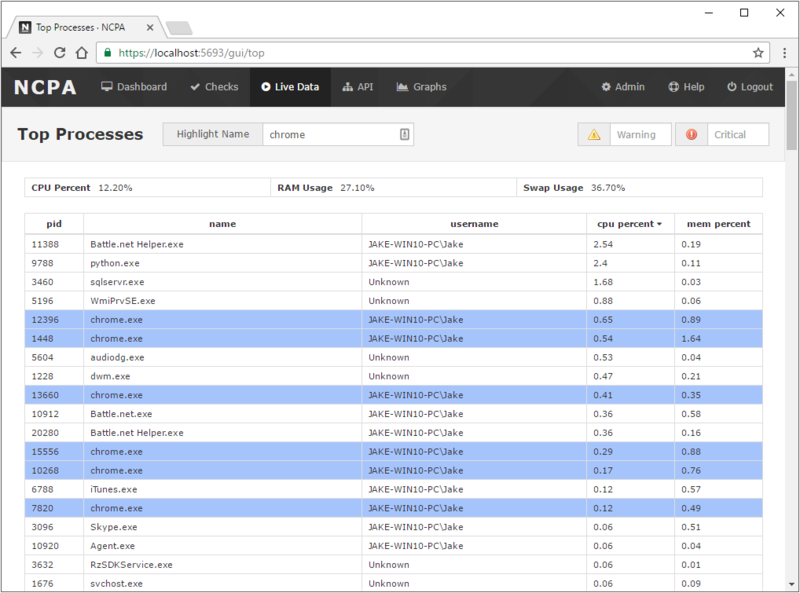 Stats Graphs - Live data graphs of CPU, memory, interface bandwidth, and disk usage. Tail Event Logs - (Windows only) Will tail the event log and show incoming logs in a table. Top Processes - A live feed of the current processes running. This is like top on linux. 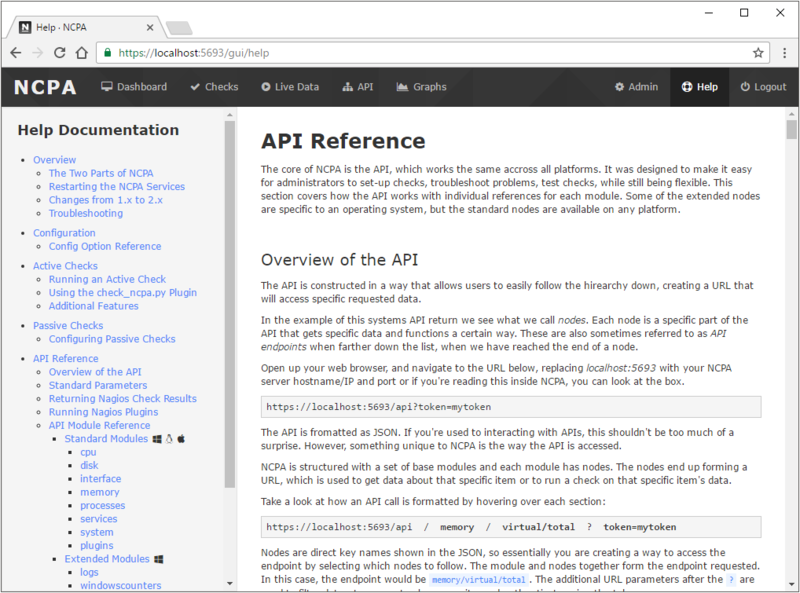 The API browser allows you to view the different sections of the API in a structured way. This is extremely helpful when trying to visualize what data you need to get with a check. You can also get help creating your active and passive check definitions by using the "view as..." functionality. 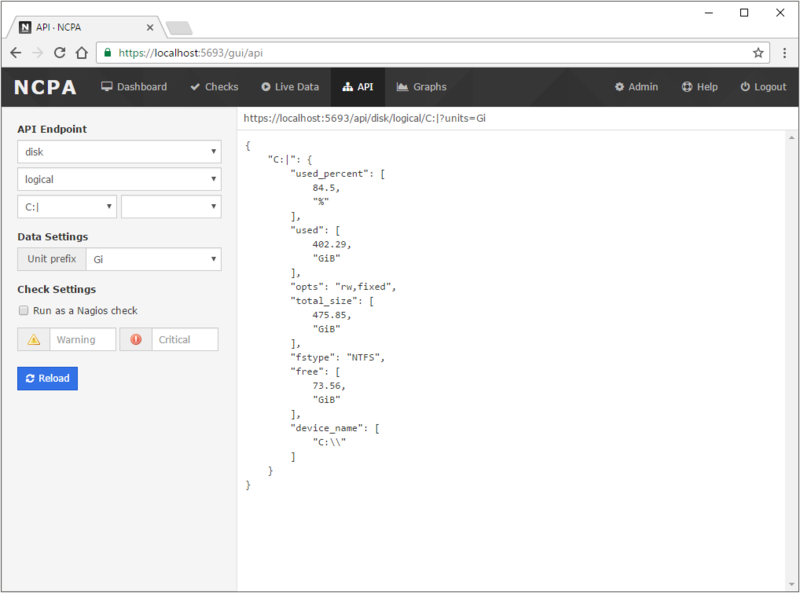 The graph generator allows you to select an API endpoint to make a real-time websocket graph of. These graphs can be embedded and use the API to pull data from NCPA. You can view your NCPA configuration. The admin section is still being worked on and is currently read-only. You can also lock it down with some configuration settings if you'd like to hide this section. The help section has documentation on how to configure, create active and passive checks, and manage your NCPA installation. Each NCPA installation comes with a copy of the full NCPA reference documentation to make it easier to find the information you're looking for while working with NCPA. Now that you've got to explore some of the features in the GUI, let's start monitoring some services. Now that you have NCPA installed, let's start monitoring something. This document will not go into too much detail on how to configure your Nagios Core/XI but it will show you how the active check is created and how you can set up passive checks to send to your NRDP server. There are many more endpoints, but you can read the help documentation to see more options. Once you've decided what to monitor, you can choose how to monitor it. There are two types of checks you can use. Active checks are ran using a plugin on the Nagios Core side, which will put most of the load on the server. If you have a lot of checks and want to move some of the load or you have a system that sometimes drops connections, you might want to use a passive check. Passive checks run on the client side and send the check results to Nagios Core for processing. NCPA can do both kinds of checks, so it's up to you to choose. 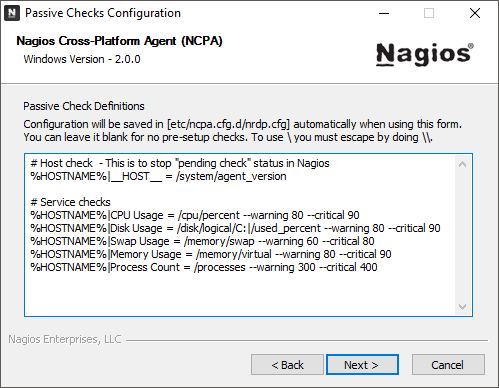 One of the easiest ways to start monitoring using active checks is by running the NCPA configuration wizard in Nagios XI. However, we will not go over how to set these up since the wizard walks you through the steps to start monitoring right away. It will give you default values, default checks, and allow you to configure what type of active checks you'd like to be performed. 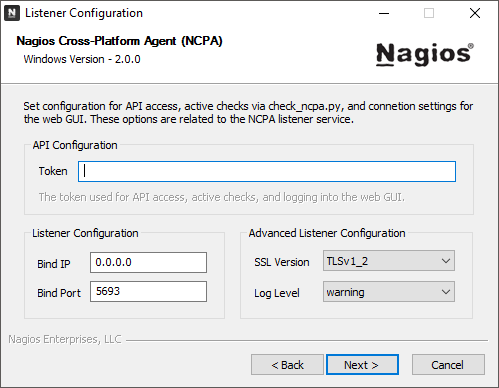 For those of you without Nagios XI, below is going to cover some basic information on how to create services for a host in Nagios Core using check_ncpa.py just like the wizard in nagios XI would do for you. If you're using a standard install of Nagios Core, start by downloading the check_ncpa.py plugin into the plugin directory, normally /usr/local/nagios/libexec. The plugin works with Python 2.x and 3.x so you shouldn't have any problems running it on your Linux distro of choice. Replace the -t 'mytoken' with your own token. This will tell Nagios to perform active checks and will create a host called "NCPA 2 Host" with checks for CPU Usage, Memory Usage, and Process Count. Restart the Nagios service and you should see pending hosts/services appear. Once they do their initial checks, you should see your NCPA data in Nagios. In order for passive checks to work, you have to configure your passive service to actually send the checks. By default in new installs of NCPA 2, no passive handler is configured. If you installed on Windows and set up NRDP during the install process then you will already have a configuration set up. However, it would be a good idea to take a closer look at your configuration just in case. Add a new NCPA configuration file to the ncpa.cfg.d directory located in the base NCPA installation directory. Use the following outline for passive checks to send to the NRDP server of your choice. Get your NRDP settings. If you're using Nagios Core, you can install NRDP manually. Nagios XI has NRDP installed by default. We will focus on Nagios XI in this configuration. Go to your Admin section, under Inbound Transfers you can set your authentication token and get your NRDP URL. Depending on what operating system you are using, restart the ncpa_listener service. You should start receiving passive check results immediately after the service has been restarted. A service restart is always required when making changes to the passive check configuration.